Canadian National Railway Co.’s (CNR.TO) new boss is moving quickly to overcome service shortcomings that have curtailed profit and angered customers. 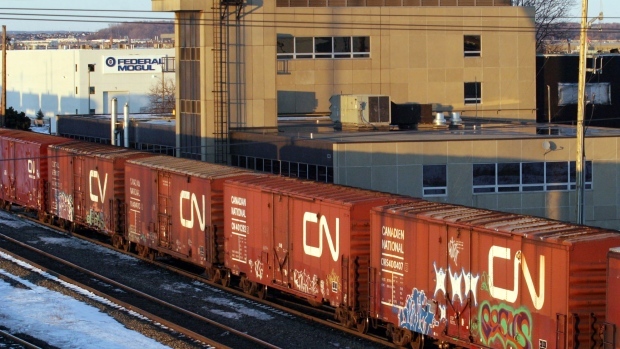 The company is weighing the purchase of 500 “centerbeam” cars to accommodate rising lumber shipments and more than 500 hopper cars to renew the grain-hauling fleet starting next year, said interim Chief Executive Officer Jean-Jacques Ruest. Canada’s largest railroad is also in talks with General Electric Co. to speed locomotive deliveries and potentially exercise an option for 60 more. Ruest, who took over as CEO last month after the surprise exit of Luc Jobin, is rushing to cope with a surge in freight traffic that has slowed operations and prompted complaints from customers such as farmers and oil producers. Canadian National is already spending a record $3.2 billion this year to bolster capacity by laying double tracks, building more siding rails and adding locomotives. Canadian National climbed less than 1 per cent to $96.99 at 10:02 a.m. in Toronto. The shares fell 7.2 per cent this year through April 20, while rival Canadian Pacific Railway Ltd. Slid 2.7 per cent and Canadian industrial stocks fell 1.8 per cent. Canadian National is catching up with demand after acting too slowly to address capacity problems, said Ruest, who previously served as the railroad’s chief commercial officer. The company also expects to finish the year with 1,000 additional train conductors, having qualified about 400 in the first quarter. Container backlogs at the ports of Vancouver and Prince Rupert, British Columbia, have been eliminated, the CEO said. But service issues in coal and lumber will require more time to fix, and grain backlogs may not be soaked up until the end of the second quarter, he added. Forest products such as lumber represented 14 per cent of Canadian National’s revenue of $13 billion last year, compared with 17 per cent for grain and fertilizers. The railroad’s current fleet includes about 12,000 hopper cars, 11,000 centerbeam cars and 2,300 locomotives. Canadian National said in December it would buy 200 GE locomotives, including about 60 due to be delivered this year. It has since leased another 130, all of which are now in service, Ruest said. Work to lay new track has begun and will probably last until about November, Ruest said. Network expansion will take place in the provinces of Alberta, British Columbia and Saskatchewan, as well as on the U.S. side in Wisconsin. The company’s network stretches across Canada and down to New Orleans.